The right medication can cure you or a loved one of a dreaded disease. The wrong medication – either the actual drug dispensed or the dosage – can cause serious, possibly permanent harm or death. If you or a loved one has been injured because of a doctor, pharmacy, hospital, or manufacturer prescription drug error, you need the services of an experienced prescription drug error attorney. Healthcare providers have a duty to ensure the medication they prescribe is suitable for both the patient’s diagnosis and the patient’s current health status and age. Many medications have the potential to cause serious side effects. The healthcare provider must inform the patient of the possibility of certain side effects and make sure the drug is not contraindicated if the patient suffers from other medical issues. The majority of older Americans take at least one prescription drug daily, and a sizable amount of the population takes several prescription drugs a day. Preventable, harmful drug interactions may occur if the doctor does not take all known prescription drugs into account. The doctor must also warn the patient against taking prescription medication in combination with particular over-the-counter drugs if severe side effects or interactions are known to occur. When it comes to prescription drug medical malpractice, it is imperative to identify the party or parties at fault. The doctor may prescribe a drug that, under normal circumstances, is appropriate for the patient. 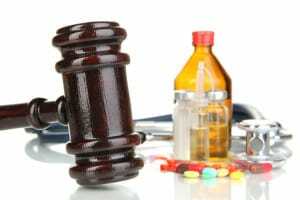 The manufacturer of the drug may hold responsibility for the injury or death resulting from the product’s use, and prescription drug medical malpractice goes may fall into the category of product liability. The pharmaceutical company not only has the duty to manufacture drugs to a specific standard but to immediately update the medical community when new adverse effects are revealed. Taking the wrong medication may have serious or even fatal consequences, but the doctor is not always at fault. While most doctors now send prescriptions to pharmacies via the internet, pharmacy errors filling these orders still occur. Pharmacy errors are primarily human errors. For example, the pharmacist may not recognize the name of a newer medication and fills the prescription with a similar-sounding but incorrect drug. Sometimes the medication name on the order is simply misread. The pharmacist may fill the order correctly – and then give it to the wrong patient. There’s a reason your pharmacist or pharmacy technician should confirm not only your name but your birth date before dispensing your medication. It’s another way to assure the right person receives the drug. If you take a medication regularly, contact the pharmacy if your latest order looks different in color, shape or size than your previous dosages. If you are prescribed a medication for the first time, check online to see if the drugs dispensed to you look like those from the manufacturer or generic provider. Check with your pharmacist for an explanation. If you’ve been injured because of a prescription error, you will need an experienced personal injury attorney. Dashner Law Firm has the experience and knowledge to help you get the compensation you deserve. Contact us today for a free consultation.